What says “summer” better than a delicious scoop of vanilla ice cream? Dropping that scoop into an ice-cold mug of root beer, that’s what. And what better time to grab the classic, fizzy treat — apparently also known as a “black cow” — than this Saturday, Aug. 6? And if you know where to look, you can celebrate for free. Many have tried, but few brew root beer better than A&W. To celebrate this special day, it’s serving up tall mugs of its legendary draft, complete with generous helpings of luscious vanilla soft serve — completely on the house. As if that wasn’t awesome enough, you can also enter for a chance to win more free floats for yourself and a friend — a whole year’s worth, in fact! 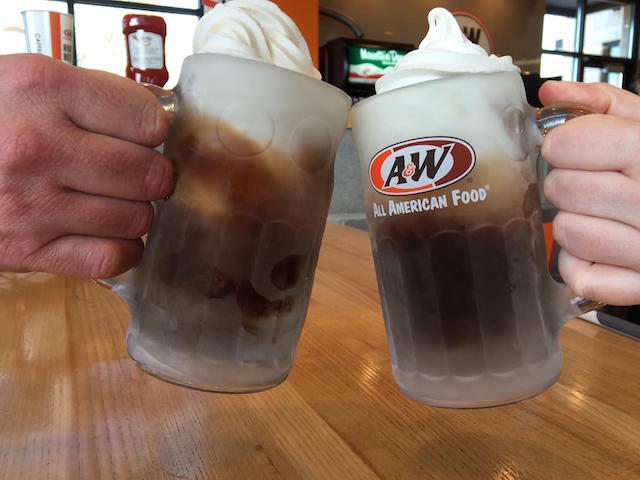 All you have to do is pick a friend (without losing all your others), and then tell A&W why she deserves a year of free floats using the hashtag #RootBeerFloatDay on Facebook, Instagram, Snapchat or Twitter. You can still enter by email ([email protected]) or using A&W’s online form. You’ll also find pre-addressed postcards available at your local restaurant. So head to your nearest A&W anytime from 2 p.m. until closing time on Aug. 6 to get your own free root beer float. Summer’s slipping away faster than that ice cream will melt into your drink, so take advantage of its sweet treats while you can! Your Turn: Will you go to A&W for a free float this Saturday?